John Landis, writer and director of films such as Michael Jackson’s “Thriller” and “An American Werewolf in London,” among many others, has put together this superb tome that gives a guide to a huge range of monsters from the world of film. Lovers of vampires, zombies and ghosts can feast their eyes on these fantastical creatures in the images, principally from the Kobal Collection, that are reproduced here. In his introduction, Landis describes the book as “a pictorial overview of monsters from the movies” that he thinks are “cool.” He aims to be entertaining rather than scholarly. Monsters in the Movies is divided into sections such as Vampires, Mad Scientists, Dragons and Dinosaurs, Space Monsters and Human Monsters among others. Within some of the main sections are subsections, for example, The Devil’s Work is split into The Devil, Hell, Wicked Witches, Killer Dolls and Scary Children. Interspersed with the main sections are conversations with renowned personalities from the world of monster movies: Christopher Lee, Joe Dante, David Cronenberg, Sam Raimi, Guillermo Del Toro, Ray Harryhausen, Rick Baker and John Carpenter. The book ends with a look at the makers of the monsters, then there are picture credits and an index. 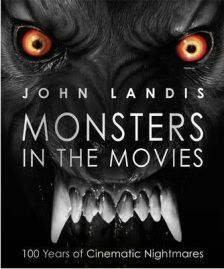 Landis introduces each of the main sections of Monsters in the Movies with a couple of pages of informative text. The subsequent pages are made up of a collection of photographs of various sizes, and each image has a caption identifying the movie and its stars. Photographs are definitely the dominant feature of the book. There is a little of every kind of monster here, from Dracula to the Kraken, or from giant gorillas to the Toxic Avenger. They can be scary or gory, but sometimes downright hilarious! Monsters in the Movies is a large format, hardcover book printed on high quality, glossy paper; most of the illustrations are in full colour, although there are of course some images taken from films made in black and white. It is a book that would make the perfect present for anyone who is a fan of the horror genre. You don’t of course have to sit down and read it from cover to cover; it is the kind of book to dip into here and there. Even those who don’t particularly enjoy reading will get their fair share of entertainment just from looking at the photographs. If it is monster entertainment that you want, this is the book for you. No Comments on "Monsters in the Movies"